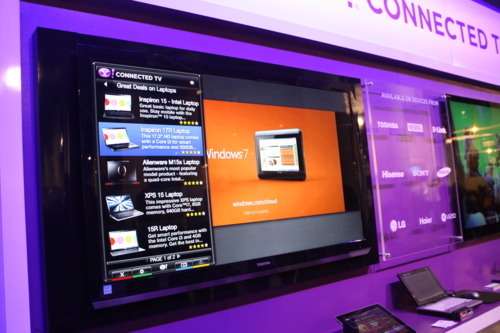 Yahoo’s version of the connected TV is designed to serve up complementary content to whatever your watching–basically, these are widgets that react to on-screen content. So when Grace Park is onscreen, you’ll get facts about her life and career (above). When a Microsoft commercial is playing, you can check out deals on new laptop (below). Seems like it will be a good space for brands to play in once it reaches critical mass, especially if we’re finding ways to co-develop good content instead of using it for interuptive ads. (Yahoo showed examples of each…the ads can be quite invasive). The Yahoo rep told me they have 5,000 developers already working with the platform, and partnerships with Toshiba, D-Link, Sony, Samsung, LG, Haier, and Vizio.